The producer price index (PPI) increased by 3.4% between October and November 2018. 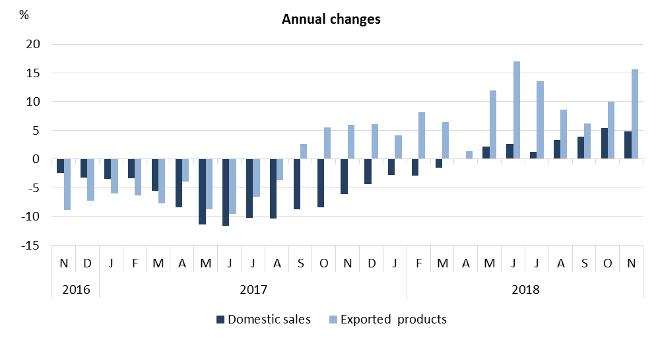 Thereof prices of power intensive industry products increased by 5.6% (effect on the index 1.9%), prices of marine products increased by 4.1% (1.0%) and prices of other manufacturing industry increased by 2.2% (0.5%). The PPI increased by 11.7% from November 2017 to November 2018. Thereof prices of power intensive industry products increased by 16.6%, prices of marine products increased by 15.5%, prices of other manufacturing industry increased by 6.4% and prices of food increased by 3.0% in the same period. Exported products have increased by 15.6% in one year, while products sold domestically have increased by 4.9%.